The advent of the industrial revolution led to an evident increase in the level of pollutants present in the atmosphere. Continuous burning of coal for energy and transportation produced excessive amounts of sulfur dioxide, a chemical compound responsible for the formation of acid rain. This compound, combined with smoke and fog, created a blend of impurities called industrial smog. The use of alternative sources of energy such as hydroelectricity and fossil fuels has helped mitigate the generation of industrial smog. This, however, brought about the development of another type of pollution: photochemical smog. The formation of photochemical smog requires a few conditions for its production to be favorable. The first is the presence of sunlight, which is needed to provide the energy for some necessary chemical reactions. The second is the condition known as temperature or thermal inversion, when cool air stays near the ground-level and warm air rises to higher altitudes. During a thermal inversion, pollutants given off by vehicles and factories are less likely to be dispersed. This is because cold air is denser than warm air, making it too heavy to rise. When vehicles burn off fossil fuels, they also release nitrogen oxides, which are the basic foundations of photochemical smog formation. Through photodissociation (or breaking down of components through light) , these nitrogen oxides generate oxygen and ozone molecules. A series of oxidation reactions forms many of the irritants found in smog, like aldehydes and peroxyacetyl nitrates or PAN. Once all of the ingredients (nitrogen oxides, oxygen and hydrocarbons from the incomplete combustion of fuel) are found in sufficient amounts, photochemical smog begins to form. Aside from this, several factors also play a role in smog formation. For example, smog is more likely to form during daytime, when the roads are mostly congested with vehicles. Another example is a place where the climate is generally windy, meaning smog formation is less because the pollutants are easily dispersed by the wind. 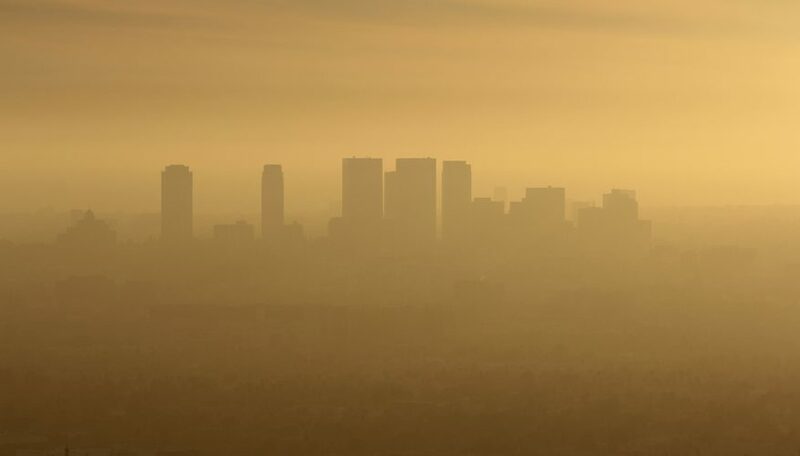 The harmful effects of smog on humans cover a wide spectrum, from mild symptoms such as coughing, sneezing and eye irritation, to those that are potentially fatal, like breathing difficulties and exposure to carcinogenic substances. These are only some of the short-term effects. Long-term effects include a decrease in lung elasticity, premature lung aging, a diminished resistance to diseases and the aggravation of already existing respiratory sicknesses like bronchitis and asthma. On the other hand, the extensive impacts of smog also affects plants. Acid severely damages crops and vegetation. PAN’s and ozone found on the ground level are absorbed by the plants through the stomata, causing damage, discoloration and loss of leaves.